Croatia ? Sounds vaguely familiar, but don’t quite know or remember ? Croatia is on the Mediterranean sea, across the Adriatic from Italy. 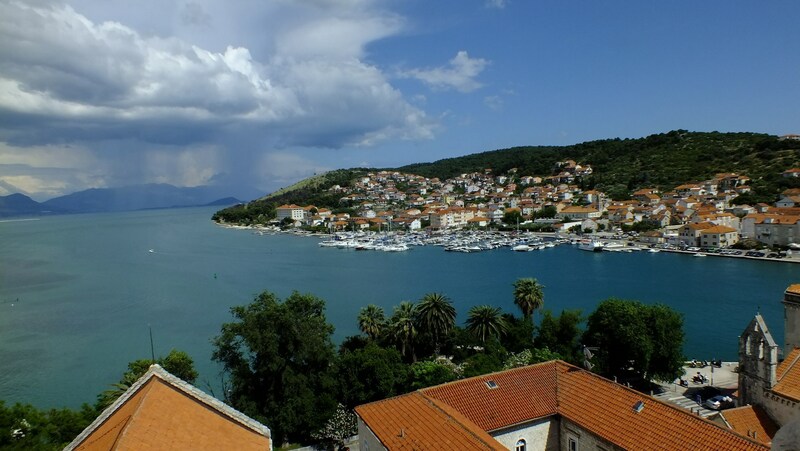 There are thousands of islands off the coast – also called Dalmatian coast. Lots of coastal towns, pretty as a postcard, with their orange riled roofs. It is one of the erstwhile Yugoslavia republics. Like most of the other East European countries – Austria, Hungary, Czech Republic – Croatia has opened up to the world only in the late 1990s and it is still not fully explored. 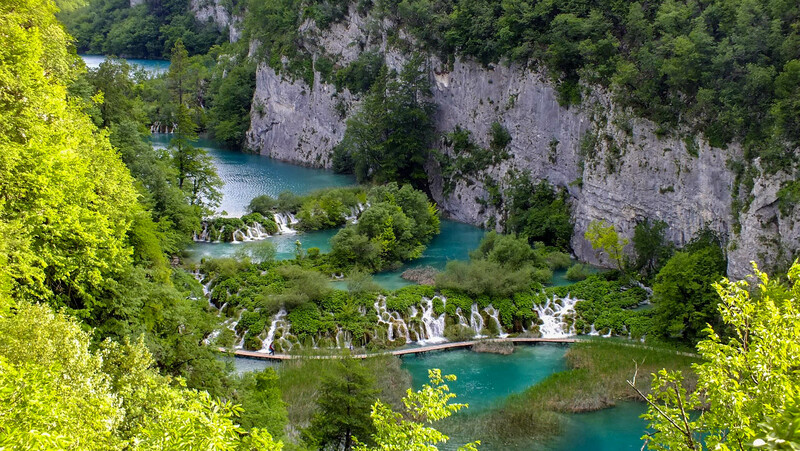 It also helps that the country is generously endowed with a beautiful Dalmatian coastline, lots of Roman outposts, the magnificent Plitvice National Park (pictured above) and genuinely nice citizens. 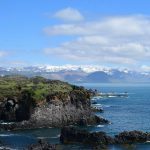 Once Croatia was finalized, the itinerary planning becomes very important because unlike Western Europe, Croatia is still finding its tourism feet. Some modes of travel are open only in certain months of the year. 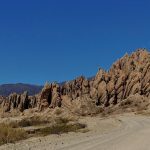 Some journeys are incredibly easy one way but quite difficult to do the reverse – just like that. Trains serve only a small part of the country. 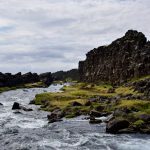 Finding out such quirks and planning your way around them is very important because with limited vacation days, there usually isn’t any day to spare to account for travel hiccups. 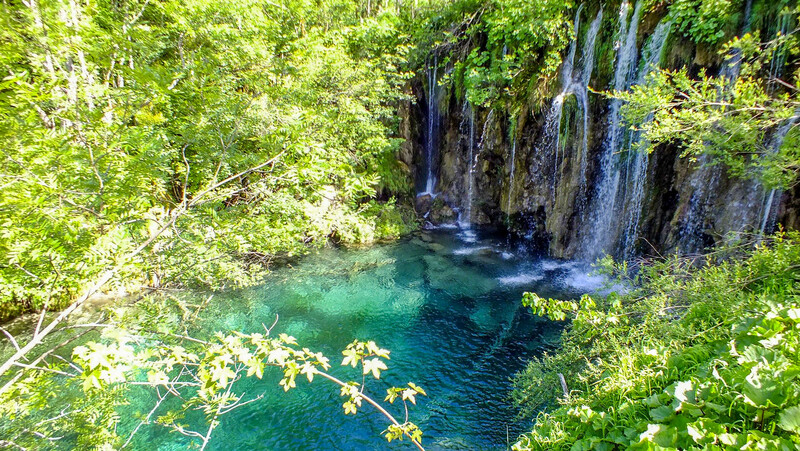 Our two must-see places in Croatia were Plitvice National Park and Hvar town. As we started reading up about the country, we really wanted to sail down the cost of Croatia, starting from Rijeka/Zadar in the north till upto Dubrovnik in the south, touching all the beautiful towns on the way. However, such “public” option is just not available. You’d have to charter a yacht which cost something from 30k-50k per head. The state ferry company Jadrolinija (http://www.jadrolinija.hr/en/home) has ferries on fixed routes, but they do not necessarily follow the tourist path as they cater to local small populations too. 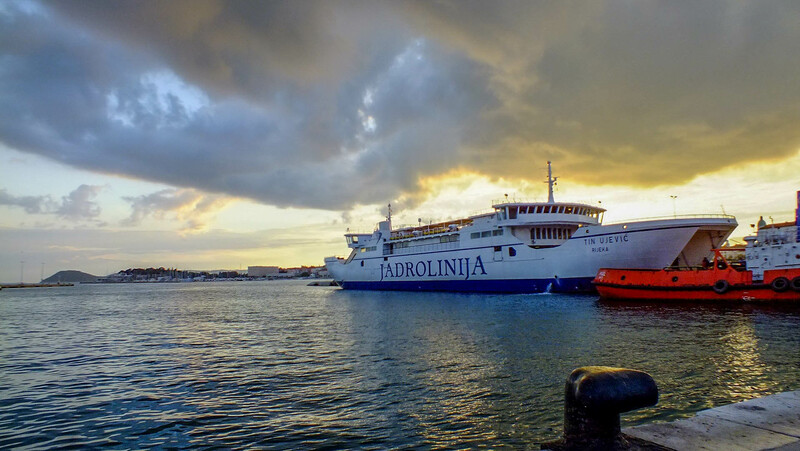 PS – Jadrolinija publishes a new schedule online for its ferries every year. Quite a few of their services run only in summer months. So check carefully before making a itinerary. 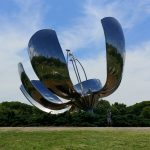 Our travel time, first week of June, was the start of tourist season in Croatia (it peaks in October) After a lot of analysis, we finalized on the following itinerary which covered as much of the country in 9 days, in reasonable expenses. Croatia, in 2013, is not part of Schengen visa, though apparently they are going to be from 2014. The documents required however, are very similar to that when applying for Schengen. Croatian embassy in Delhi prefers to receive queries by email (croemb.new-delhi@mvep.hr) and they respond reasonably quickly with answers. They aren’t very big about communicating on phones. 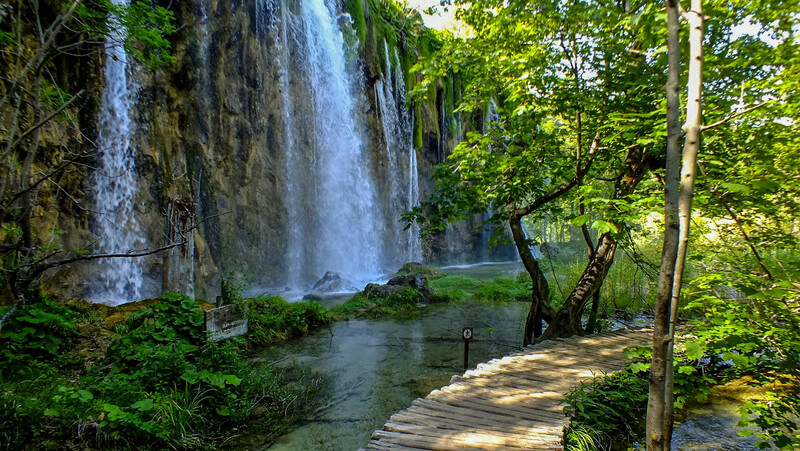 * The main quirk in the Croatian tourist visa is the requirement of hand delivering the visa application. You cannot courier/mail them applications. It has to be hand delivered, and that too by the applicant themselves. I am not sure why the embassy wants to see the applicants in person, but they must have their reasons. The way to avoid having to go to Delhi, is to take an appointment with the Mumbai (or Kolkata) consulates. They will review all the above documentation, ask you some basic questions about itinerary and give you an “endorsement” letter saying they have met you. Once you have the letter, you can hire a good travel agent (we used Thomas Cook) to hand deliver the application on your behalf to the Croatian Embassy in Delhi. There are no direct flights to Croatia from Mumbai (or anywhere in India). We had option of flying via Frankfurt, Munich, London, Paris, Istanbul, Zurich etc . Turkish Airlines via Istanbul was the cheaper option but there was a 10 hr layover at Istanbul. Lufthansa (via Frankfurt) had the smallest layover( 2hr10 min) and that’s what we took. It cost a little over Rs 60,000 per head for return tickets. Frankfurt airport is nothing to write home about. Quite low ceilinged and somewhat dark – nothing opulent like Dubai or snazzy like Hong Kong or Changi. Zagreb has a very nice network of trams spread well across the city. 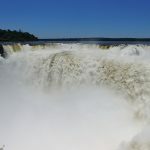 They are very well maintained, nowhere even half full and are very frequent. At 10 kuna per ride (1 kuna = approx Rs 10), it made great sense for longer travels but a pinch expensive for just 2 stops. However, we soon realized that there was essentially no checking for any tickets. The doors opened at the press of a button, not an electronic ticket, so you theoretically did not need a ticket (locals had monthly passes of course). Also, weirdly, the only place to buy the tickets were the convenience stores next to the tram stops – there is no vending machine or official ticket seller. Each tramstop had 2 such stores – one on each side of the road (trams ran on tracks in the middle of the road). On our first trip on the tram, we thought we’d buy tickets aboard the tram but found there is no option of doing that. We got down at our stop, feeling guilty about our freeriding. 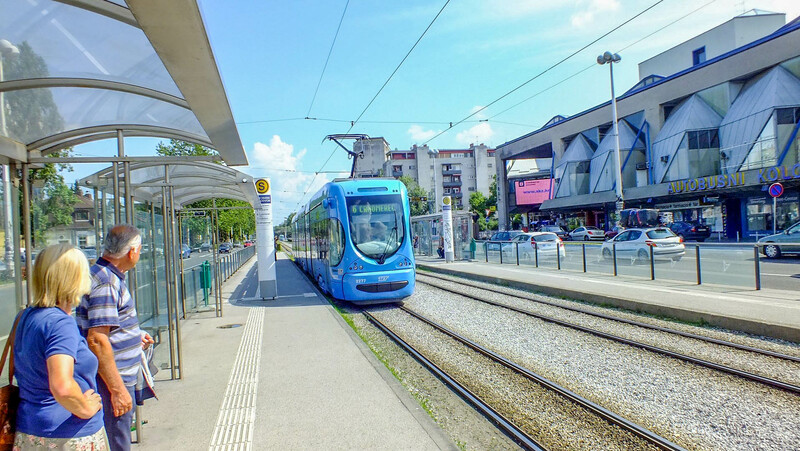 * We freerode one more time in Zagreb when we reached just in time for a tram and we did not want to wait for the next tram. 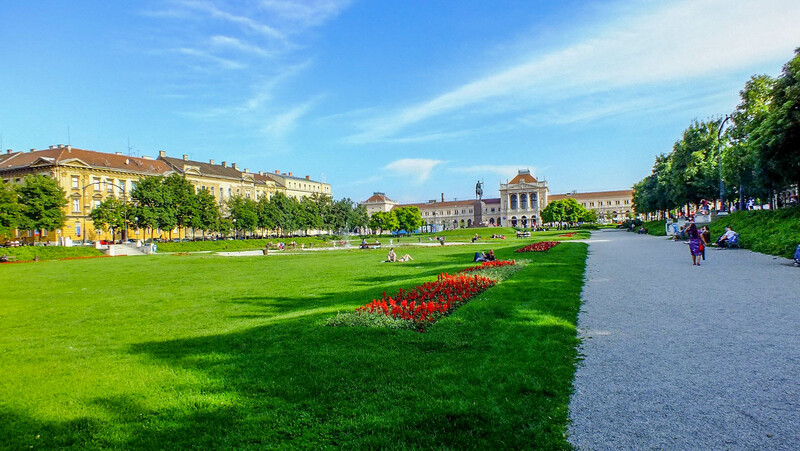 The central part of Zagreb is the prettiest and resembles other European cities with 17th century style buildings, interspersed with beautiful parks with citizens (and their babies) enjoying the start of summer. 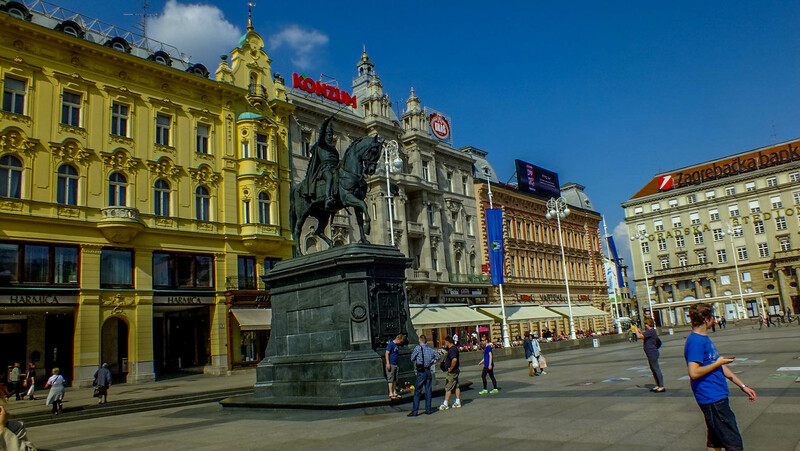 The town square – called Jelačić square – is the nerve centre, surrounded by high-end shops, restaurants etc. We spent our first day in Croatia exploring Jelačić square, the gardens surrounding it, the Zagreb Cathedral and Maksimir Park. Zagreb Cathedral, with its two huge towers, is the tallest building in the whole of Croatia. During our visit, unfortunately, one of the towers was under renovation and covered with scaffolding. But it is still a beautiful building. On the grounds next to the Zagreb Cathedral are these old walls dating back to the Crusades. 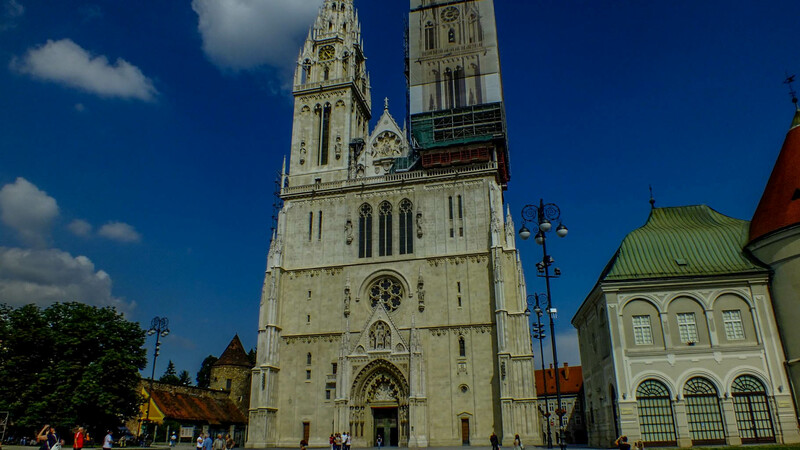 With Zagreb not having a single skyscraper, the Cathedral is the highest building in the city (and in the country). The interiors are typical of big European churches – high ceiling, stained glass windows and chandeliers. Overall, the cathedral’s exterior is more imposing than the interior. On the way back to our hotel, very close to Jelačić, was a small little park called Zrinjevać . We sat a while with popcorn, watching Zagreb citizens go about their daily life. Kids running around and dogs playing. Staying in Europe undoubtedly has its charms and these clean open parks etc are definitely one of the beautiful things in any European city. Next to the park was a pretty yellow Art Pavilion building followed by more open parks where older kids were playing sports. After checking in, we took an early lunch and reached the park entrance. Inside the Park, there are multiple trails through the lakes, of varying distance. We decided on the longest trail – H – hoping to cover as much of the park. The trails are so designed that a road train (photo below) ferries tourists to the top, at the start of the trail, and then they walk down the various trails to the lower lakes. The H trail also includes a lake crossing in an electric boat. 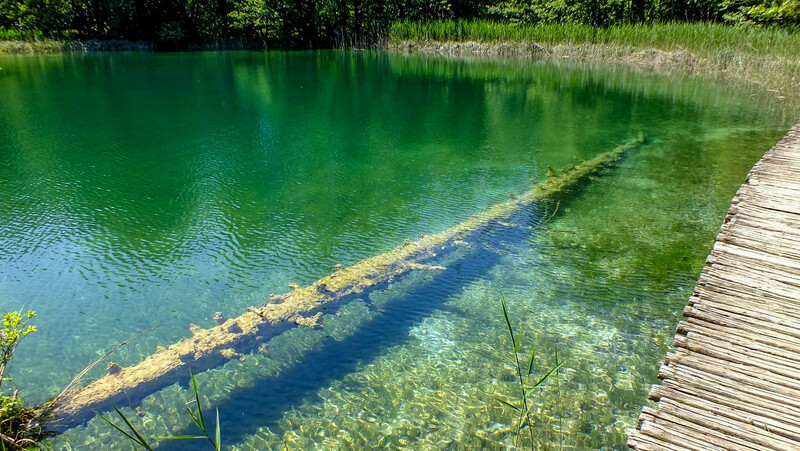 Accomodation is a little tricky in Plitvice. 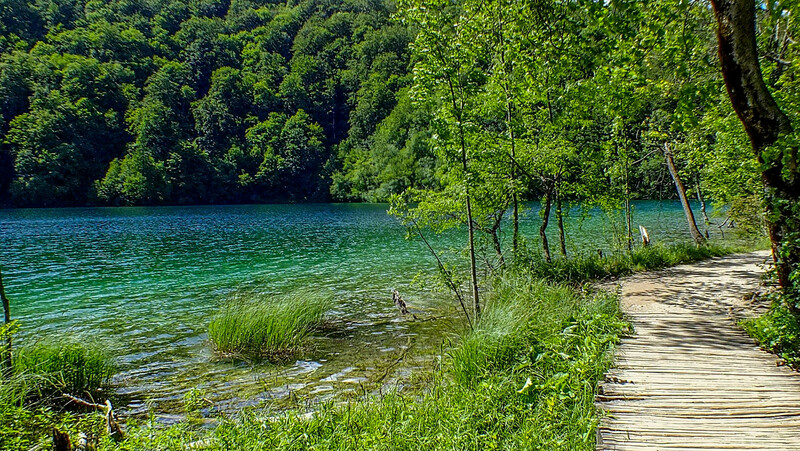 There are 3 old hotels situated inside the park, next to the entrance – Hotel Bellevue, Hotel Plitvice & Hotel Jezero. These are Soviet-era constructions. Lots of (200+) rooms, old world neat and clean, but not luxurious – and lacking maintenance is some places. For what it offers, it is somewhat expensive at €100 a night we paid (and upto €150 in peak season). Food is doubly expensive too. And the hotel is essentially designed for guided tours. Their main customers are busloads of old European tourists – with buffet meals. The hotel’s main charm is that they are just 100m from the park entrance. 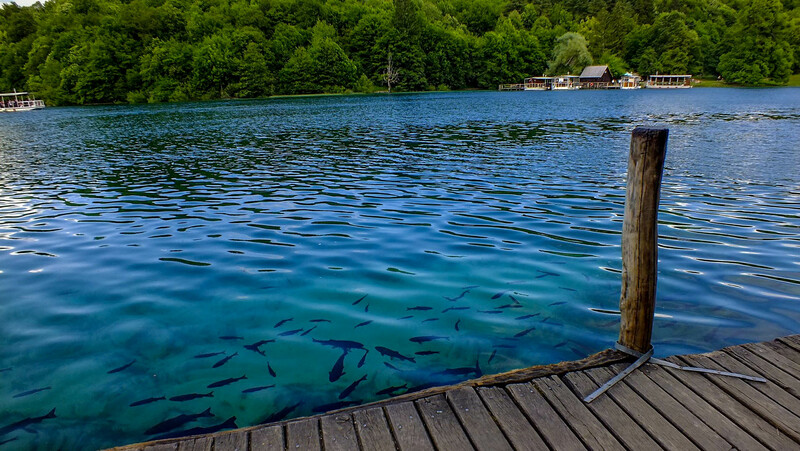 The alternative is the town/village of Jezero about 2-3 km from the Park entrance. There are many small guesthouses, B&B’s and homestays available at better rates. More eating options too. 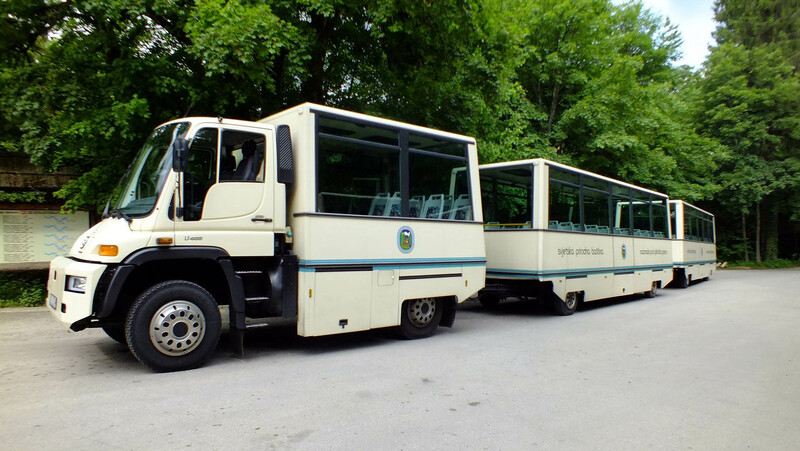 But there is just no public transport between Jezero and the park gates. If you are driving a rented car, it is not a concern. But if you come by bus, you’d have to trek 2-3 km both ways in addition to your walking around the park. And the road is a 2-lane highway, with dense forests on both sides. Not ideal walking area, esp after dark. – While there are schedules, the buses might vary a little in timings, so it is good to reach the bus stop 15-20 min early. – The bus stop itself is very small, but the buses do stop if you wave them down (unless they are full or are tour buses).